As if she would have let anybody else steal her sunshine. Rihanna's Met Gala dress closed down the star-studded night and it was a finale worth waiting for. The singer arrived in a yellow and gold fur cape/coat from celebrated Chinese designer Guo Pei. It was regal. It was electric. It was FASHION in the best way possible. 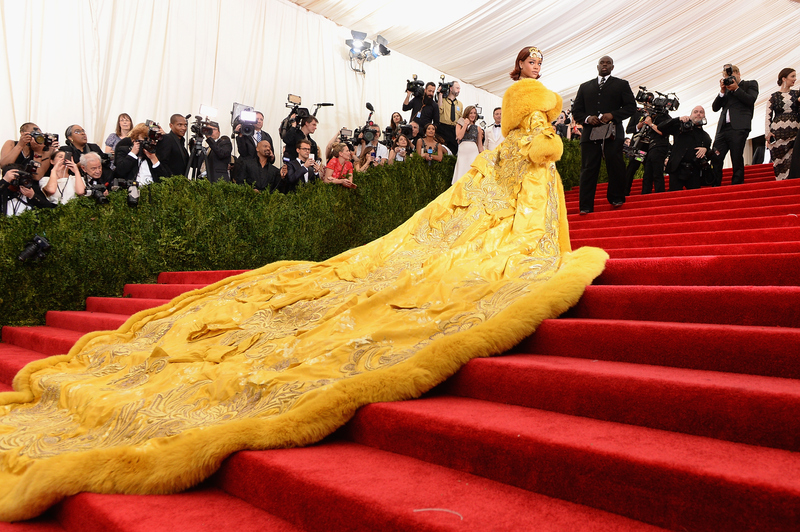 Nothing but praise hands emojis to Rihanna for daring to stand out in a sea of couture. During fashion's biggest night, when practically every pop goddess, including Madonna, Cher, Lady Gaga, and Jennifer Lopez was in attendance, the Barbadian beauty snatched everyone's crown and put it on her perfect head of auburn hair with a fur-lined cape and a train that required multiple handlers. Rih topped off her look with an ornate dragon headpiece that truly fits the "Princess of China" singer.